Don’t let your pampered pouch miss out on the festive fun anymore, treat them to their very own Personalised Dog Christmas Tree Decoration. Made from pine wood and engraved to show to the natural grain of the tree, this decoration is a truly perfect Christmas tree accessory. A talking point when visitors call, the decoration is personalised with your pets name above the paw print motif. 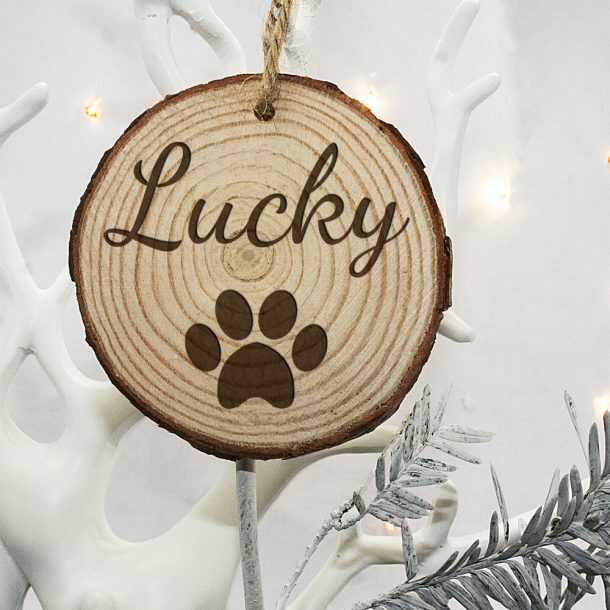 Strung with a rustic string ready to hang straight on to the tree it’s a great way to show how much you love your dog, because after all they are a mans best friend!